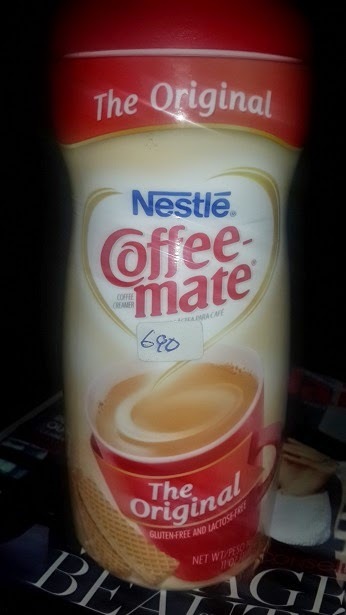 Product Review: Nestle Coffee-mate the Original, Gluten-free, Lactose Free. Hey coffee lovers! Great news!! So that's how I was shopping for my usual skimmed milk o, my eyes jammed this product and I began to read as usual. 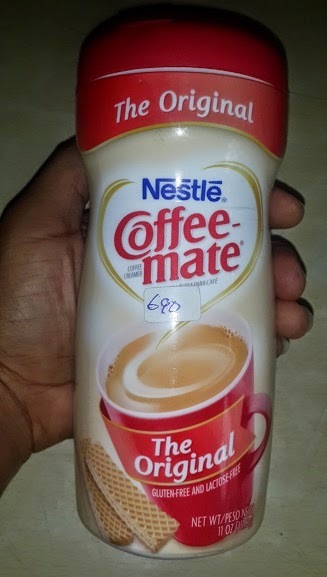 (I take time to read these things o, and check expiry dates too) I saw low calorie, gluten free...hmmm, I smiled, quietly dropped the skimmed milk and paid for this instead. I just love trying out new things. What I look out for in packed products, especially the ones that are new to me are: Calorie content per serving, Sodium content, Saturated fat content, Cholesterol, trans fat. All these have to be really low. TIP: Don't buy too many of 1 kind of product at a go. Try them one by one, till you find what you like. That way, you will save loads of money. Eating healthy is very interesting, there are loads of new things to try daily. Its low in calorie content! It contains 10 calories per 2g (1tsp) full. So if i use 2 tsps, in my low calorie coffee, I will be consuming about 30 calories. I use a low calorie sweetener. Its Gluten free, Lactose free and Cholesterol free!!! (I know you will say, other ingredients nko?) Wait first, i no be scientist o. Lol! Anyone that is Lactose intolerant can have this. It doesn't leave me feeling gassy. You know that feeling you get hours later after drinking full cream milk? You begin to leave your signature smell everywhere! Choi! The size: This was the first thing that got me smiling. It will last for weeks! Its 311.8g That's a lot. If you take 2 tsp daily, you cant finish this in 3 weeks. The price: This size (311.8g)cost N690, i think its worth it. You may find it cheaper or more expensive in your area. It can be used in teas and cocoa drinks as well. Its a non-dairy creamer, which means one has to get their daily dairy needs from other sources. Its in powder form, so i just add 2 tsp fulls to my morning coffee. It melts instantly. Yumm! Corn syrup solids, vegetable oil (partially hydrogenated coconut or palm kernel,hydrogenated soy bean), Sodium caseinate (a milk derivative)**, and less than 2% of Dipotassium Phosphate(Moderates coffee acidity), Mono and diglycerides(prevents oil separation), Sodium aluminosilicate, Artificial flavour, amnatto color. Trying to pronounce all these names gave me small headache. Lol! I looked up some of the ingredients and they are not all that bad. I haven't experienced any side effects from using this. But, you know, as with every food, moderation is key, so please consume with caution. Has anyone tried this product, did you like it? Would you try this?